Bagpiping has been an integral part of the campus life at Carnegie Mellon University since 1939. The Kiltie Band was started by Lewis W. Davidson and each year students who were interested in learning to play the bagpipes could enroll. In 1985, James H. McIntosh MBE, a world renowned piper, assumed the position as director of the pipe band. During his tenure, it was proposed that Carnegie Mellon institutionalize bagpipes as a legitimate major in its Conservatory of Music. Mr. Elden Gatwood, artist-lecturer of oboe, approached the department head, Marilyn Taft Thomas, with a proposal that bagpipes be formalized as a major and hire Mr. James McIntosh to teach it. Mr. Gatwood, a bagpiping student of Mr. McIntosh, spoke of his extraordinary gifts as a teacher and his international reputation as a bagpipe performer. 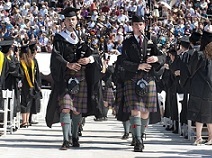 "The entire tradition of the campus has been celebratory bagpiping. It makes sense for us to acknowledge bagpipes as a legitimate musical instrument. While there are bagpipe teachers around the world, what Carnegie Mellon offers is a program of study where a person can get a complete grounding in music as well as specific instruction on the instrument" (Thomas, M.T. 1991). The faculty supported the idea with enthusiasm and the proposal was accepted. Prior to this program, no opportunities existed anywhere in the world for the serious student to study bagpiping at a bachelor’s degree level. Director Andrew Carlisle leads the Carnegie Mellon Pipes and Drums, which is made up entirely of current university students and alumni. Carlisle is also the professor in charge of the bagpipe major in the School of Music. The band performs frequently at official university events and has also made a welcomed return to the competition platform where it has won Highland Games at the South Maryland Celtic Festival and at the Colonial Highland Gathering at Fair Hill, MD. In 2012 the band was invited to perform as the Guest Band at the New Hampshire Highland Games held at the Loon Mountain Ski Resort where the band performed to over 25,000 spectators and also at the world famous “Celtic Classic” festival in Bethlehem, PA where crowds of over 200,000 lined the streets. Submit a Pipes and Drums Request Form to book a Pipes and Drums performance at events. Completed forms should be e-mailed to Andrew Carlisle. Andrew can also be contacted if you are a student interested in joining the band, learning to play the Great Highland Bagpipe or snare drum.